15-year gilt yields fall 18 basis points as investors seek safe havens such as government bonds and gilts following uncertainty over the US and North Korea conflict. The 15-year gilt yields decreased by 18 basis points to 1.41% during the month as investors seek safe havens such as bonds and gilts following increasing geopolitical tension. 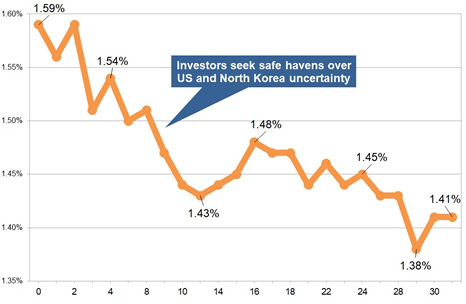 The conflict between the US and North Korea over missile tests has been ongoing during 2017 and increasing intensity will see a fall in the 15-year gilt yields, sending annuity rates lower. Unusually providers have increased rates by an average of 1.73% and we would expect rates decrease by -3.53% in the short term. 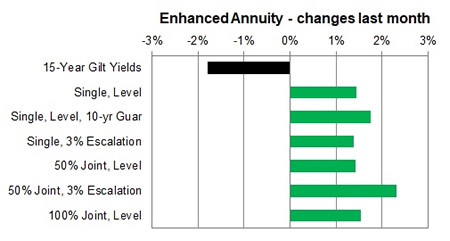 For smoker and enhanced annuity providers increased their rates by an average of 1.59% on average and rates may decrease by -3.39% in the short term. For the month of September 100% of annuity rates increased by up to 4.5% with 14% remaining unchanged and only 0% decreasing. 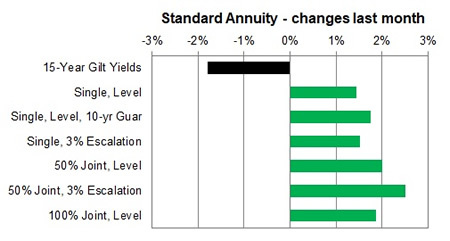 Standard annuities increase by an average of 1.73% during the month. 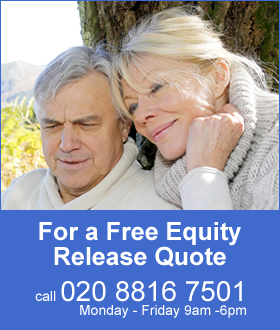 All age groups increased and in particular those aged 55 to 65 for all annuity basis with increases of up to 3.9%. For enhanced and smoker providers increased rates across the board with an average rise of 1.59%. There was a strong rise for those aged 55 to 60 with increases up to 4.5%. Only those aged 75 on a single life basis had no change for the month.